What many users of such feeds do not realize, is that many of these tools provide an incomplete picture of actual securities trading activity. In most instances, the data reflects only market activity taking place on the Toronto Stock Exchange (TSX). 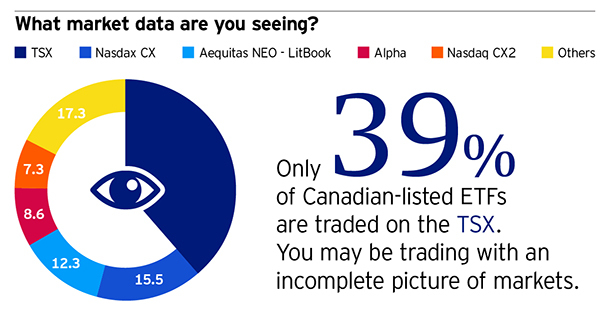 In the past, such single-source data would have painted a fairly accurate picture, but today there are 11 other venues where Canadian ETFs may trade. To give you a sense of how Canadian-listed ETF trading was spread across platforms, see below for the market share of total traded volumes for the various available venues in 2016. The result is that many ETF investors may be trading with inaccurate or incomplete price and liquidity information. Without the whole picture, market efficiency suffers and investors may struggle to obtain an accurate price for their securities. For example, let’s look at our TSX-listed PowerShares 1-5 Year Laddered Investment Grade Corporate Bond Index ETF (PSB), and the data that you may see on the widely used Thomson ONE terminal. Source: Thomson ONE, as at March 20, 2017. For illustrative purposes only. The first row shows the default data that is shown to most investors, which is trading and pricing data that has occurred on the TSX. The second row shows a consolidated quote across all trading venues in Canada. The bid/ask size and total traded volume are higher in the consolidated quote. Based on total volume traded on that day, the TSX quote represents only 24% of the consolidated quote. Note also that the last traded price on one trading venue could be stale if only a certain share of the trades occurred on that exchange. A consolidated picture would provide the most up-to-date last price based on trading of the security on all trading venues. Incomplete bid/ask data makes it difficult for both the advisor and individual investor to ascertain the “right” price before they place a trade. Without an accurate picture of market activity, advisors may struggle to meet best-execution requirements for their clients. The NEO Exchange has called on regulators to mandate the provision of consolidated market data. Invesco supports this campaign for more transparent markets, because we believe that a properly functioning capital market relies on investors having confidence in the data they see on screen. In the interim, investors who actively trade ETFs should seek access to additional data feeds from other trading venues. Investors should also be mindful of the market data websites they use and the source for the data. For example, Google Finance and TMX Money only provide TSX data. However, websites like Bloomberg.com offer a consolidated feed. To access consolidated quotes on a Thomson ONE terminal, investors should update the tickers on their watch list by using “-MK” instead of “-T” at the end of the symbol. This can be made the default setting by selecting “Canada MK Pref” in Properties. While there may be costs associated with real-time consolidated quotes, the more efficient pricing data may make it worthwhile for advisors who trade on behalf of their clients. FTSE TMX Global Debt Capital Markets Inc ("FTDCM"), FTSE International Limited ("FTSE"), the London Stock Exchange Group companies (the "Exchange") or TSX INC. ("TSX" and together with FTDCM, FTSE and the Exchange, the "Licensor Parties"). The Licensor Parties make no warranty or representation whatsoever, expressly or impliedly, either as to the results to be obtained from the use of the FTSE TMX Canada Investment Grade 1-5 Year Laddered Corporate Bond Index, and FTSE TMX Canada Real Return Federal Non-Agency Bond Index ("the Index") and/or the figure at which the said Index stands at any particular time on any particular day or otherwise. The Index is compiled and calculated by FTDCM and all copyright in the Index values and constituent lists vests in FTDCM. The Licensor Parties shall not be liable (whether in negligence or otherwise) to any person for any error in the Index and the Licensor Parties shall not be under any obligation to advise any person of any error therein.